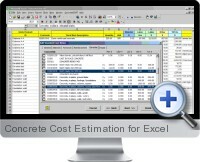 Concrete Cost Estimation for Excel is an easy way to build quick and accurate concrete construction cost estimates. Work in a single Excel environment to quickly create, build, and manage concrete cost estimates. As a construction professional, improving cost estimating efficiency translates to profits. Concrete Cost Estimation for Excel supports advanced features including on-screen Concrete Calculator for easy volume calculations. Point and click cost item selection. Standard cost data covering concrete construction. Built-in reporting or use Excel's reporting functions. All in one complete, integrated solution. Cost items include Material and Labor costs. Cost items indicate Labor man hours for easy project scheduling. Other cost category to cover subcontract, supervision and indirect costs. Summary and Detail reports including Price Quotation and Bill of Material. Step-by-Step Tutorial for easy and fast learning.